Bust half dollars, referring to all early half dollars made between 1794 and 1839, include various design types ranging from the Flowing Hair type, include the Draped Bust type, and wrap up with the Capped Bust design. Robert Scot is credited as the engraver for the Flowing Hair and Draped Bust types, while Gilbert Stuart is noted as the designer for the latter. John Reich designed the Capped Bust type. Flowing Hair half dollars were struck in 1794 and 1795, and they represent the first type of half dollar ever struck. Both issues are exceedingly scarce, and enthusiasts recognize several varieties, particularly among the 1795 issues. Collectively, a few thousand examples survive representing either year. 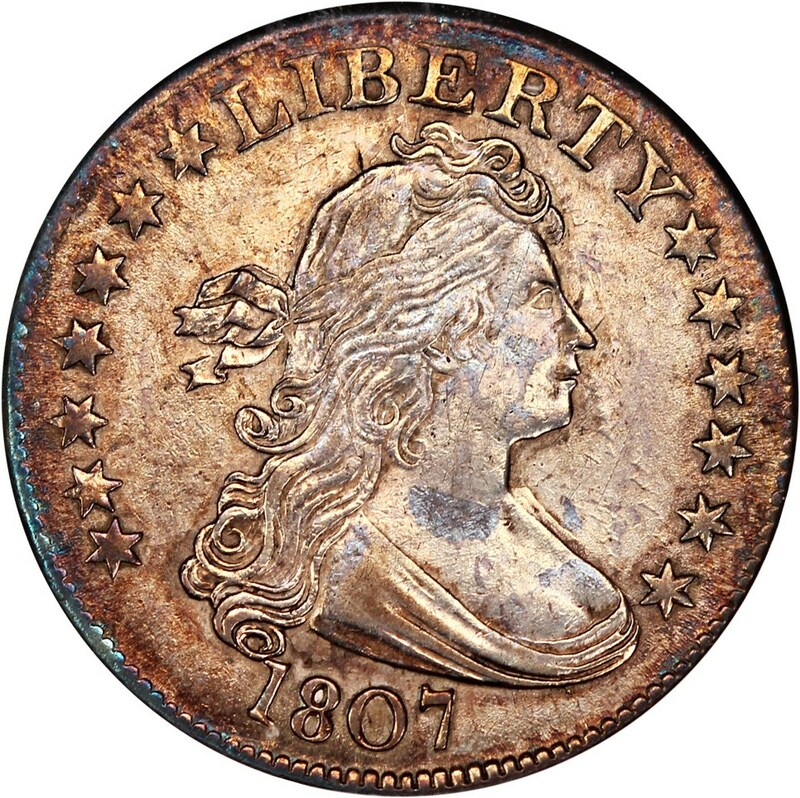 Meanwhile, the Draped Bust motif ran from 1796 through 1807 and as a type is more widely available than the Flowing Hair halves, but all varieties of the 1796 and 1797 halves are exceedingly rare, and combined over both years only 3,918 minted, and only a few hundred examples ? mostly circulated ? remain today. The Capped Bust half dollar ran from 1807 through 1839, and there are at least two subtypes within this group: the larger-diameter lettered edge type that was struck from 1807 through 1836 and the smaller-diameter reeded-edge halves that were minted from 1836 through 1839. While Capped Bust halves are plentiful in the circulated grades for more issues, there are dozens of recognized minor and major varieties among the Capped Bust half dollars, thus meaning this series is a real challenge for enthusiasts to collect. One of the scarcest is the 1817 7 Over 4, which has just eight known specimens and has sold for $356,500 in a grade of AU50. 1828 50c Sq Base 2 Sm 8 Lg Let. Shop 47.25 68.00 70.00 77.00 81.00 90.00 94.00 101.00 115.00 128.00 143.00 169.00 228.00 358.00 390.00 468.00 845.00 1,090.00 1,230.00 1,310.00 1,880.00 3,440.00 6,880.00 27,200.00 -- -- -- -- -- -- -- 1828 50c Sq Base 2 Sm 8 Lg Let. 1828 50c Sq Base 2 Sm 8 Sm Let. Shop 81.00 135.00 143.00 162.00 176.00 195.00 240.00 292.00 325.00 358.00 390.00 455.00 611.00 910.00 1,060.00 1,380.00 1,880.00 2,500.00 2,910.00 3,750.00 5,000.00 9,380.00 30,200.00 -- -- -- -- -- -- -- -- 1828 50c Sq Base 2 Sm 8 Sm Let.